Released August 16, 2010 just in time for Father’s Day. Finally, Dads get what they’ve always wanted for Father’s Day. No more socks and jocks… it’s a book about BEER! Australia has a rich and vibrant beer culture which goes mainly unrecognised. Most Australians would be surprised to learn that we have over 150 different Australian beer brands with an average of around 3 beers each. The Beer Lovers Guide to Australia is a snapshot of the Australian beer industry, showcasing those beer brands plus over 100 Breweries and 100 Specialist Beer Venues. Australia’s relationship with beer started when the first fleet dropped anchor in Botany Bay in 1788: they drank mugs of Porter to celebrate the discovery of this great land. Since then it has been a colourful journey that is now poised for a renaissance of beer appreciation in the mainstream Australian culture. 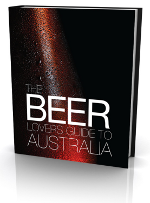 The Beer Lovers Guide to Australia is a guide for anyone looking to explore the world of Australian Beer. Dr Peter Aldred – What is Beer? The book’s Location Guide lists Australia’s most passionate beer venues state by state, making it the perfect way to plan your next beer adventure. There’s never been a better time to drink Australian beer and there’s never been a more comprehensive guide to Australian beers, the people who make them and the best places to drink them. RRP $34.95Available August 16, 2010 from Breweries, Bars and Bookstores. For more information be sure to check out www.beerloversguide.com.au.